Ky Ewing’s magisterial work on international competition law is here updated to take stock of the prodigious expansion of anti-cartel enforcement throughout the world in the intervening years. • guidelines on distinguishing useful collaboration from collusive activity. Nine new appendices have been added to this edition, covering such informative material as new statistical data about U.S. enforcement, details on the dramatic cooperation now taking place among nations in anti-cartel enforcement, and suggestions on how companies and practitioners should respond to multinational investigations. Foreword to Second Edition 2006. Foreword to First Edition. Preface. 1. Introduction: The Challenge of Proliferating Competition Laws. 2. The Situation Today: A Broad Look at Differences in Current Laws. 3. History of Government Attempts to Combat Restraints of Trade. An Ancient Effort with Familiar Tensions. 4. What We Can Learn from History. 5. Looking Forward from Antitrust History. 6. 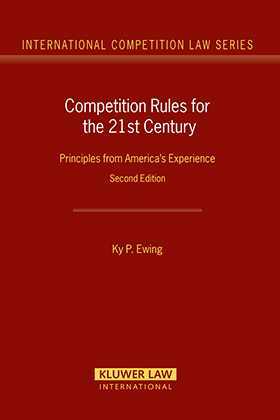 Principles for Crafting Competition Policy Enforcement in the 21st Century. Conclusion. Appendices. I. Global Agency Survey Results. II. Charts from Survey Results. III. Survey of Economic Studies. IV. U.S. Statistics: 1968-2000. V. U.S. Merger Challenges 2000-2001. VI. U.S. Merger Challenges Data 1999-2003. VII. U.S. Merger Investigations Data 1996-2003. VIII. U.S. Merger Transactions Data 1995-2004. IX. Cartel Prosecutions. X. Update on Cartel Prosecutions. XI. International Cooperation Against Cartels. XII. Cartels: 1. How to respond to multiple jurisdictions. 2. History of leniency/amnesty programs. XIII. ICN Mission Statement May, 2006. XIV. Implementation of ICN Recommendations. References. Index.